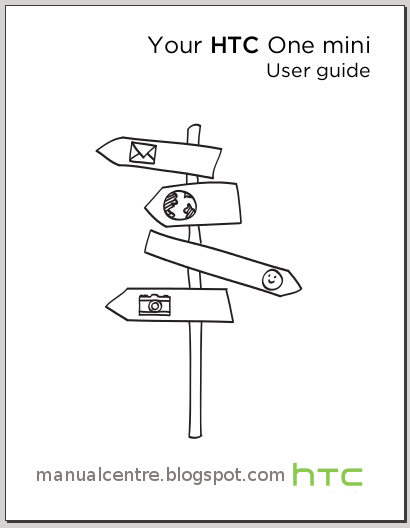 The HTC One mini manual is available in pdf format. It comes with 172 pages (2.8 MB) and available in english language. The HTC One Mini has advantages / pros such as good design, Aluminium body, big display, supported by Dual core processor, Lots of RAM, and Fast mobile data support (4G). While for disadvantages / cons such as No removable battery and no expandable memory. The HTC One mini also known as HTC M4. It's run on Android (4.2.2) Sense UI platform with 1024 MB of RAM. It's powered by Dual core, 1400 MHz, Krait processor and Qualcomm Snapdragon 400 chipset. There is 16 GB internal memory and equipped with 4 megapixels camera. In addition also equipped with 1.6 megapixels front facing camera. The phone has phsical dimensions of 5.20 x 2.49 x 0.36 inches with weight are 4.30 oz. The smartphone includes 4.3 inches with a resolution of 720 x 1280 pixels. How about network? the network support for GSM/UMTS and LTE. The HTC One mini user manual (PDF) explains and provide detail reference information such as phone part overview, Setting up your new phone for the first time, using home screen, Installing a software update, Unlocking the screen, Using power saver mode, using camera and gallery, Changing your wallpaper, Changing your ringtone, notifications, and sounds, using messages, phone calls, using contacts, using web, using Google maps and HTC car, using wi-fi and bluetooth, Connecting to a virtual private network (VPN), wi-fi printing guide, Protecting HTC One mini with a screen lock, Restoring a SIM card that has been locked out, phone settings guide and more.